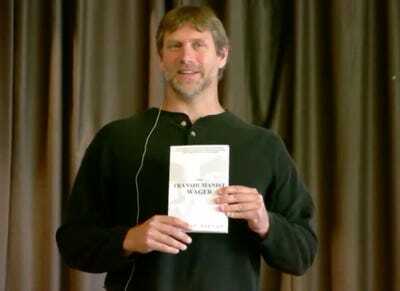 Zoltan Istvan plans to cheat death by uploading his brain onto a computer server. They call themselves transhumanists, and they believe technology can help humans overcome their fundamental physical and mental limitations. “Based on current trends, I hope to upload my mind at some point around the middle of this century,” he tells Bartlett, which would allow his mind to live on long after his body dies. Zoltan’s quest for immortality is not wholly selfish. As a former war correspondent for National Geographic, Zoltan traveled to Vietnam to learn more about the country’s “bomb diggers” — ex-farmers who can make a fortune digging up and selling the salavaged metal from unexploded landmines. One day, Zoltan almost stepped on one of these landmines, and this near-death experience led him to dedicate his life to transhumanism. Indeed, Zoltan is quick to tell Bartlett of the many ways humanity would benefit if everyone turned their brains into computer files, from increasing our intelligence to reducing our carbon footprint. Dr. Anders Sandberg, one of the world’s leading experts on mind uploading, agrees: “whole brain emulation,” as he calls it, will solve many of humanity’s problems. Buy Bartlett’s book here to read more about the lesser known aspects of the internet.